The Stacks Training Program is a comprehensive course that walks new customers through the process of website creation with Stacks from project planning and information architecture to technical training and design. The program combines training preparation modules and live training. New customers will go through the training preparation materials in each module and once complete will meet with a trainer for a hands-on review of the content. The live training sessions are delivered through WebEx and require a computer with a microphone and a speaker so the trainer and customer can speak to and hear each other. Customers can also dial in on the telephone to access the audio portion of the training. More information about how to set up and use WebEx can be found on our WebEx page. On completion of the Stacks Training Program, customers will receive a certificate. Get Ready for Training With This Program Overview. Thu, January 3rdCustomize Your Sliders! 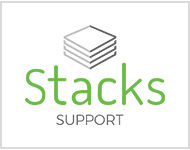 Wed, December 5thHappy Holidays From Stacks! Happy Holidays from your Stacks Trainers Dennis and Jennifer! We wish you all the best of the season and a Happy New Year! New Feature - Virtual Exhibit: Create visual browse and search experiences of your collections, displayed in a card-style layout.